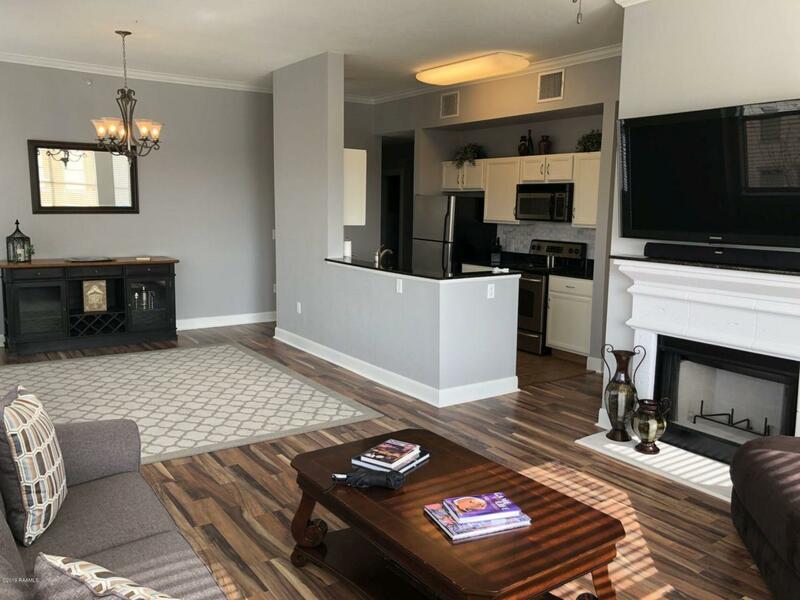 Great corner unit on 4th floor has just been updated with new paint, including kitchen cabinets, lighting and plumbing fixtures, wood flooring and beautiful porcelain tile back splashes. This unit was a show unit when complex was new due to it's panoramic views of fountain and more. Lots of windows and natural light. All windows are covered with wood blinds. Other features include wood burning fireplace, split floor plan, open living, dining and kitchen area, solid granite throughout, stainless appliances and assigned garage parking. Owner has access to pool, common computer and conference rooms and club house, with reservation. Your also within walking distance of restaurants and shopping!Dues include water, sewer, trash disposal, pool, rec room, grounds keeping, insurance and repairs/maintenance.